I don't drink pop very often, but when I do, my favourite kind is ginger ale. 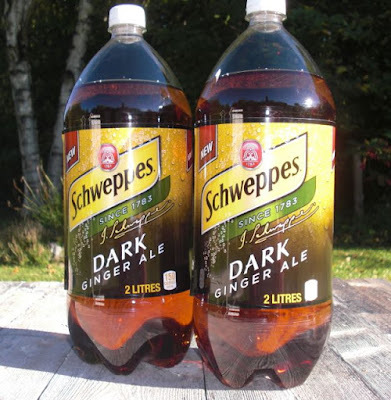 Recently there was a coupon for a new type of ginger ale, Dark Ginger Ale. The deal was, buy two 2L bottles of the new ginger ale, and get $2 off. Name brand pop is often around $2 for 2L, so I waited for a sale. A $1 sale, to be exact. So for just $0.25 ($0.13 tax on each bottle, rounded down to just a quarter because we don't use the penny anymore), I got two bottles of pop. Deal! Pretty near free pop is good enough on its own, but the best part is that this Dark Ginger Ale actually tastes amazing. With my first sip I wasn't quite sure, but then I drank one of the 2L bottles waaaaayyyy too fast. It is a wonderful mixture of spicy and sweet. I love it. I haven't heard of this. I tend to go more for something like Dr. Pepper.